I read Stefan's review of the Firefox Brief today which I found interesting in itself. I did learn about dynamic bookmarks in Firefox from the article on top of it. I have never used the dynamic bookmarks feature of Firefox before as I prefer to use an external application or web-based service instead to display RSS feed updates to me. But when I thought about it for a moment it did seem to make sense to integrate RSS feeds into Firefox directly. Not only would it make the display self-sufficient and independent of third-party services, it would also be convenient as I have Firefox open all the time anyway. Netvibes, the service that I have been using for about a year is having technical difficulties lately and I decided to give other integrated systems a try. The first thing I did was to backup my opml information on Netvibes. These file contains information about all feeds that I'm subscribed to. The option was a bit hidden in Netvibes, you find it in the profile section under Feeds. Then I realized that Firefox had no option to import an opml file directly which meant I had to find an add-on that would import the opml file for me. OPML Support is an add-on for Firefox that adds this functionality to the Bookmarks Manager. It provides an export and import option for opml files. This made it easy to transfer my RSS feeds from Netvibes into Firefox Live Bookmarks. 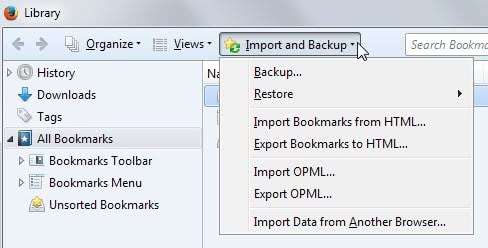 To use the extension simply open Firefox's Bookmarks Manager after installation and select Import and Backup from the menu. There you can select import OPML to import RSS feeds to the browser. The extension added an export option to the same dialog which can be useful if you want to move away from Firefox and use them in a different application. As a sidenote, Brief also offers full OPML support, so you may not need the OPML Support-Extension, though it may prove useful from time to time. The best Firefox Extension out there. I use this every day, and I Highly recommend it for anyone using the not-so-great Google Reader, or netvibes. This is highly customizable and really easy to read all of your feeds offline at your leisure. 5-star RSS/ATOM/JSON/XML reader (yes, it supports all media types – even mediaRSS).